Persisting infections are often associated with chronic T cell activation. For certain pathogens, this can lead to T cell exhaustion and survival of what is otherwise a cleared infection. In contrast, for herpesviruses, T cells never eliminate infection once it is established. Instead, effective immunity appears to maintain these pathogens in a state of latency. We used infection with HSV to examine whether effector-type T cells undergoing chronic stimulation retained functional and proliferative capacity during latency and subsequent reactivation. We found that latency-associated T cells exhibited a polyfunctional phenotype and could secrete a range of effector cytokines. These T cells were also capable of mounting a recall proliferative response on HSV reactivation and could do so repeatedly. Thus, for this latent infection, T cells subjected to chronic Ag stimulation and periodic reactivation retain the ability to respond to local virus challenge. Certain viruses persist as a direct consequence of their ability to inactivate T cells that would otherwise result in their elimination. These include persisting infections by pathogens such as lymphocytic choriomeningitis virus (LCMV) (1, 2) and hepatitis C virus (3, 4), both of which can be cleared by an effective T cell response (5, 6). For this class of pathogen, it is thought that chronic or ongoing T cell stimulation is an essential contributor to the inactivation required for virus persistence and ongoing viremia (7, 8). This inactivation takes the form of T cell exhaustion and senescence, where the cells progressively lose various properties associated with full effector function (9). In contrast, other viruses, especially those belonging to the herpesvirus family, do not require compromised immunity for their prolonged survival. Once established, these viruses are never cleared from the infected individual even in the face of effective T cell immunity; instead, they survive by use of various immune evasion strategies (10). In addition, many of these pathogens persist in a state of latency, which is characterized by limited transcriptional activity and little if any virus replication (11). Importantly, effective immunity is actually crucial for maintenance of latency, as for a range of herpesviruses, reactivation from latency is often a major complication associated with generalized immunosuppression (12, 13). In certain instances, active suppression of herpesvirus reactivation involves direct T cell recognition of persistently infected cells (14). The chronically stimulated T cells involved in virus control are unlikely to be compromised by such events, as their inactivation would result in disease recrudescence. However, although recent reports suggest that T cells associated with latent infection are indeed functional (15–17), there has been no formal demonstration that the cells actually involved in suppressing reactivation are not exhausted by the recognition event or inactivated by the reactivation process. In this study, we show that for persisting HSV infection, T cells involved in latency control remain fully functional and maintain a self-renewing ability despite undergoing chronic stimulation during the latent phase of infection. C57BL/6 and gBT-I × B6.CD45.1 (gBT-I.CD45.1) mice were bred at the Department of Microbiology and Immunology of The University of Melbourne. The gBT-I.CD45.1 TCR and gzmBCreERT2/ROSA26EYFP transgenic mice have been described previously (18, 19). gzmBCreERT2/ROSA26EYFP mice received daily injections of tamoxifen (1 mg) via i.p. injection as described (18). Viruses used were the KOS strain of HSV-1 (HSV) and K.L8A with a position 8 alanine mutation in the glycoprotein B (gB)498–505 immunodominant determinant derived by recombining HSV.gB-L8A (20) with the KOS strain of HSV and selecting for a recombinant that gave equivalent replication and lesions as found with the wild-type virus. Mice were infected with 1 × 106 PFU virus via flank scarification as previously described (21). Latently infected ganglia (T8–T12) were transplanted under the kidney capsule of syngeneic recipients as described (17). C57BL/6 mice received 5 × 104 naive gBT-I.CD45.1 lymph node cells via i.v. injection. For LCMV infections, mice were infected with 2 × 106 PFU LCMV clone 13 by i.v. injection. T cells were recovered from skin, ganglia, and ganglia grafts as described (17, 22). The following fluorescently conjugated Abs were from BD Pharmingen: anti-CD45.1 (A20), Vα2 (B20.1), anti-CD8α (53-6.7), anti–IFN-γ, anti–TNF-α, anti–IL-2, and anti-CD107a/b. Anti–Tim-3, anti-Lag3, and anti-CD160 were purchased from eBioscience. Anti-granzyme B was from Invitrogen, and anti–PD-1 was from BioLegend. H-2KbgB(498–505)–PE tetramer was generated at the Department of Microbiology and Immunology of The University of Melbourne. For analysis of T cell proliferation, 1.25 mg BrdU was injected i.p. as two injections 12 h apart, and mice were analyzed 12 h later. Uptake was detected with a BrdU Flow Kit according to the manufacturer’s instructions (BD Pharmingen). Lytic granule release and cytokine production by gBT-I.CD45.1 T cells was measured by stimulating lymphocytes from pooled ganglia (T8–T12 from two mice) with 0.1 μM gB498–505 peptide in the presence of brefeldin A, monensin, and anti-CD107a/b. Cells were cultured for 5 h before staining for surface markers. Cells were then fixed using a Cytofix/Cytoperm kit (BD Pharmingen) and stained with intracellular Abs before analysis by flow cytometry. HSV forms a prototypic latent infection confined to a localized compartment, the sensory ganglia that innervate the site of initial infection, usually skin or mucosal tissue (23). It is known that latent infection is maintained under tight immune control, partly as a result of the action of CD8+ T cells and their secretion of granzyme B and IFN-γ (14, 24, 25). As a consequence, inhibition of virus reactivation likely requires ongoing local T cell stimulation by the persistently infected neurons. To show this is the case, we transferred HSV-specific T cells from the TCR-transgenic mouse, gBT-I, into C57BL/6 mice prior to subjecting the animals to skin infection and examining the T cells in skin and ganglia at the end of the lytic (day 8) and during the latent (after day 20) phase of infection. Fig. 1A shows that gBT-I cells in skin, a tissue that clears HSV at the cessation of lytic infection, expressed low levels of granzyme B during latency. In contrast, those T cells in ganglia harboring latent HSV infection had high levels of granzyme B during the latent phase of infection. Granzyme B expression by HSV-specific CD8+ T cells in the ganglia is Ag dependent. Mice were seeded with naive gBT-I.CD45.1 CD8+ T cells and flank infected with HSV. 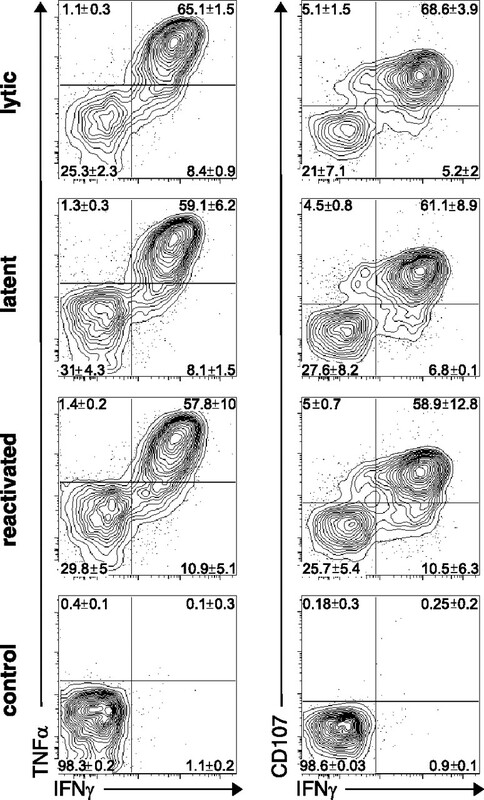 (A) Granzyme B expression was assessed by flow cytometry on gBT-I.CD45.1 cells isolated from the infected skin flank (left panel) or ganglia (right panel) during the lytic (day 8; black line) or latent (day 30; gray-shaded) phases of infection. (B) Mice were seeded with 5 × 104 naive gBT-I T cells (left panel) or with 5 × 104 memory gBT-I T cells isolated from animals infected with wild-type HSV >30 d earlier (right panel). Mice were infected with HSV on the left flank and the HSV gB-mutant virus K.L8A on the right flank (HSV + K.L8A) or with either virus alone on a single flank. Shown are numbers of gBT-I cells in the spleen 8–9 d after virus challenge. (C) Mice were infected with HSV on the left flank and K.L8A on the right flank. The number of gBT-I.CD45.1 cells in the ganglia was enumerated by flow cytometry at 20 d (left panel) or 35 d (right panel) after infection. Control (ctrl) was T cells harvested from non-innervating ganglia (T2–T6) from K.L8A-infected flanks (not determined [N.D.] at day 20 postinfection). Bars represent the mean + SEM with five to six mice per group. Statistical analysis was performed using an unpaired Student t test. **p < 0.005. (D) Representative FACS plots showing granzyme expression by gBT-I.CD45.1 cells in pooled HSV-infected (black line) or K.L8A-infected ganglia (gray-shaded) 20 d after infection. Data are representative of five to six mice per group and three independent experiments. It has recently been shown that granzyme B can be upregulated in a nonspecific manner by virus infection (26). To demonstrate that the presence of local infection was not a major driver of nonspecific granzyme B expression within the ganglia, we made use of a recombinant virus (K.L8A) that carries a mutation within the immunodominant determinant from the gB. The mutant virus did not stimulate HSV-specific gBT-I T cells, which otherwise proliferated and expanded after adoptive transfer and flank skin infection with wild-type HSV (Fig. 1B, left panel). The failure of gBT-I T cells to recognize mutant virus was not limited to just the priming phase of the response, and memory gBT-I cells transferred into naive hosts were also unable to respond after challenge by the mutant virus (Fig. 1B, right panel). Note that both wild-type and K.L8A viruses replicate with equal efficiency within the sensory ganglia and exhibit similar levels of skin disease and peak virus load (Supplemental Fig. 1). In mice simultaneously infected with wild-type and mutant virus on opposing flanks, responding gBT-I transgenic T cell populations lodged and then persisted in sensory ganglia infected with either virus (Fig. 1C). Ganglionic gBT-I cell numbers were largely equivalent in wild-type HSV- and K.L8A-infected ganglia in early latency and diverged as latency progressed, although even at day 35 postinfection, the latter still outnumbered those found in control noninfected ganglia from the same animals. Importantly, activation of gBT-I cells, as measured by granzyme B upregulation, was dependent on specific recognition, with high levels of this effector molecule only found in sensory ganglia harboring wild-type virus infection (Fig. 1D). Thus, because gB-specific T cells have been implicated in latency control (14), these results argue that granzyme B expression by T cells within sensory ganglia was a marker for recognition of cells persistently infected with HSV. Given that the T cell stimulation within the latently infected ganglia is ongoing, and chronic stimulation has been associated with T cell inactivation (1, 2, 27), we next sought to determine whether the T cells persisting in the sensory ganglia retained full functional capabilities. To this end, we examined a number of functional parameters; specifically, the secretion of cytokines TNF-α and IFN-γ and the upregulation of surface expression of CD107, a marker of granule exocytosis. Simultaneous expression of multiple effector molecules has been used as a measure of T cell fitness (28), and their expression is progressively lost as T cells become exhausted from chronic stimulation (9). The extent of this polyfunctionality was assessed during the lytic and latent phases of HSV infection. In addition, T cells were also examined after HSV reactivation, which was initiated by ganglionic excision and transplantation under the kidney capsule of naive recipients, a method previously shown to initiate this event (17). As can be seen in Fig. 2, a high proportion of effector T cells recovered during the lytic phase of infection had multifunctional capabilities. After a 5-h stimulation with gB peptide, ∼70% of transgenic T cells recovered from acutely infected ganglia were able to produce IFN-γ. Furthermore, the majority of these IFN-γ–expressing T cells were also able to produce TNF-α and expressed CD107. Importantly, the frequency of polyfunctional T cells as measured by these parameters was similar for ganglia harboring lytic or latent infections, and this was also true when it came to IL-2 production (Supplemental Fig. 2). In addition, T cells that had been subjected to virus reactivation also retained these capacities. Thus, sustained and repeated exposure to virus Ag in the ganglia did not result in functional inactivation of virus-specific CD8+ T cell responses. Functionality of HSV-specific CD8+ T cells during lytic and latent phases of infection. Mice were seeded with naive gBT-I.CD45.1 cells and flank infected with HSV. T cells were isolated from the ganglia at day 8 (lytic) or day 30 (latent) postinfection or from latent ganglia that had been transplanted beneath the kidney capsule of naive syngeneic mice (reactivated). T cells subject to transplant-induced reactivation were harvested from ganglia grafts 9 d posttransplantation. T cells were stimulated with gB498–505 peptide for 5 h and then analyzed for lytic granule release (CD107a/b) and IFN-γ and TNF-α production. 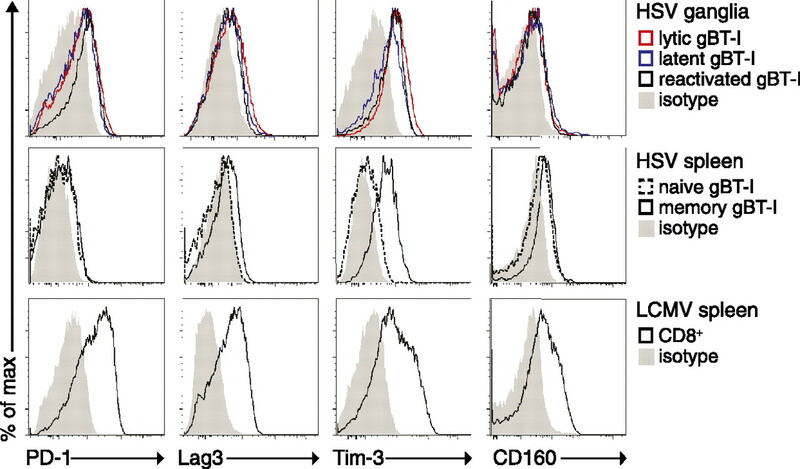 Shown are representative flow cytometry profiles of gBT-I.CD45.1 T cells (gated on CD8+ Va2+ CD45.1+ events) coexpressing IFN-γ and TNF-α (left panels) and IFN-γ and CD107 (right panels). Control panels are gBT-I.CD45.1 cells (isolated from latently infected ganglia) incubated without gB498–505 peptide. Frequencies represent means of six mice ± SEM. Data are representative of three independent experiments. After prolonged antigenic exposure during chronic infections such as LCMV, virus-specific CD8+ T cells have been shown to upregulate multiple inhibitory receptors, including PD-1, which correlates with T cell exhaustion (29, 30). To determine whether intraganglionic T cells showed an exhausted phenotype, we assessed the expression level of markers associated with this condition, notably PD-1, Lag3, Tim-3, and CD160 (29–31), during the lytic, latent, and reactivation phases of infection. As shown in Fig. 3, T cells in sensory ganglia showed only modest increases in expression of these exhaustion markers compared with memory T cells in the spleen. There was no difference between the respective lytic and latent phases of infection, when T cells are either actively involved in virus clearance or undergoing chronic stimulation. Critically, expression levels were less than those on control exhausted T cell populations from mice chronically infected with LCMV. Overall, these data suggest that T cells found in latent ganglia do not exhibit an overtly exhausted phenotype. 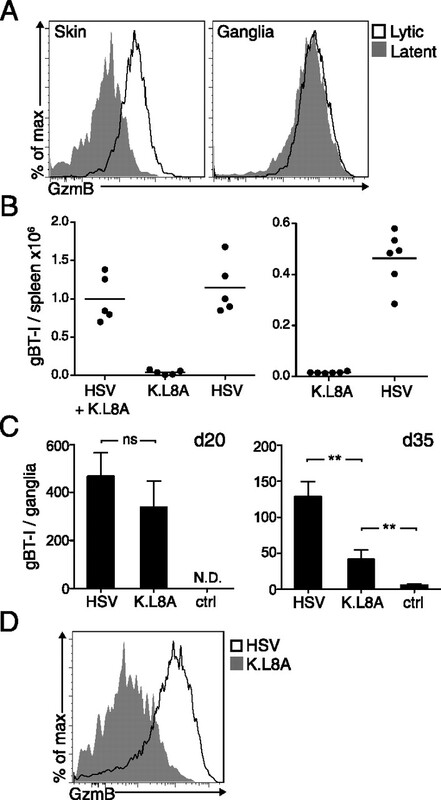 Limited expression of inhibitory receptors by HSV-specific CD8+ T cells in the ganglia. Mice were seeded with naive gBT-I.CD45.1 cells and flank infected with HSV. T cells were isolated from the ganglia during lytic (day 8) or latent (day 30) phases of infection or from ganglia subjected to transplantation-induced reactivation (day 9 posttransplantation). Shown is expression of PD-1, Lag3, Tim-3, and CD160 on lytic (red line), latent (blue line), and reactivated (black line) ganglion gBT-I.CD45.1 T cells. Appropriate isotype staining is also shown (gray-shaded). Expression of these markers is shown on naive and memory (day 30 after HSV infection) gBT-I.CD45.1 T cells in the spleen (middle row). As a positive control, C57BL/6 mice were infected with LCMV clone 13, and splenic T cells were isolated at day 14 postinfection and stained for inhibitory receptor expression (gated on CD45.2+ CD8+ events, bottom row). Flow cytometry profiles are representative of five to eight mice per group. The results above demonstrated that T cells within HSV-infected ganglia maintained a polyfunctional phenotype and did not bear markers of exhaustion. In addition, we had previously shown that ganglionic T cells underwent proliferation and expansion during HSV reactivation (17). Thus, despite ongoing or chronic stimulation within the sensory ganglia, local T cells appeared fully functional and retained self-renewing capability. However, it remained possible that such capabilities were confined to a subpopulation of sequestered cells not involved in active virus recognition. To exclude this, we made use of the gzmBCreERT2/ROSA26EYFP transgenic mice that permit permanent marking of cells expressing granzyme B (18). This marking involves a transgene-driven Cre recombinase that irreversibly induces yellow fluorescent protein (YFP) expression in cells expressing granzyme B, and only if the latter occurs at the time of administration of the inducing agent, tamoxifen. To ensure that T cells were marked only during latency, we administered tamoxifen between days 30 and 35 postinfection, well after viral Ag presentation in the lymphoid compartment is extinguished (22) and lytic infection has subsided (21). HSV reactivation was initiated at day 40 by means of transplantation-induced reactivation (Fig. 4A), and the reactivating ganglia, isolated from tamoxifen-treated gzmBCreERT2/ROSA26EYFP transgenic mice, contained a population of YFP-expressing T cells (Fig. 4B). Because the drug was administered between days 30 and 35 after the initiation of infection, this meant that the T cells marked by Cre recombination had recognized infected neurons during latency. Most of the YFP+ cells, but only a minority of non-marked T cells, were virus specific, recognizing the immunodominant determinant from gB as determined by tetramer staining (Fig. 4C). Consequently, the bulk of T cells responding to virus infection during latency appeared specific for this single immunodominant determinant. Importantly, both YFP+ and YFP− T cells specific for gB had undergone equivalent proliferative bursts after virus reactivation, as assessed by BrdU incorporation (Fig. 4D). Overall, HSV-specific T cells actively involved in recognition of virus-infected cells during latency appeared fully capable of proliferation and self-renewal during the process of virus reactivation. Chronic Ag stimulation does not impair the ability of ganglion-resident T cells to proliferate upon virus reactivation. gzmBCreERT2/ROSA26EYFP transgenic mice were flank infected with HSV and treated with tamoxifen from day 30 to 35 postinfection. Ganglia from these mice were transplanted beneath the kidney capsule of naive syngeneic mice on day 40 postinfection. BrdU was administered to recipient mice as two i.p. injections 12 h apart on day 7 posttransplantation. Grafts were recovered on day 8. (A) Schematic depicting the strategy for the analysis of proliferation between YFP+ and YFP− labeled T cells. (B) Representative flow cytometry profiles depicting the frequency of YFP+ CD8+ cells from pooled grafts of BrdU-treated mice. 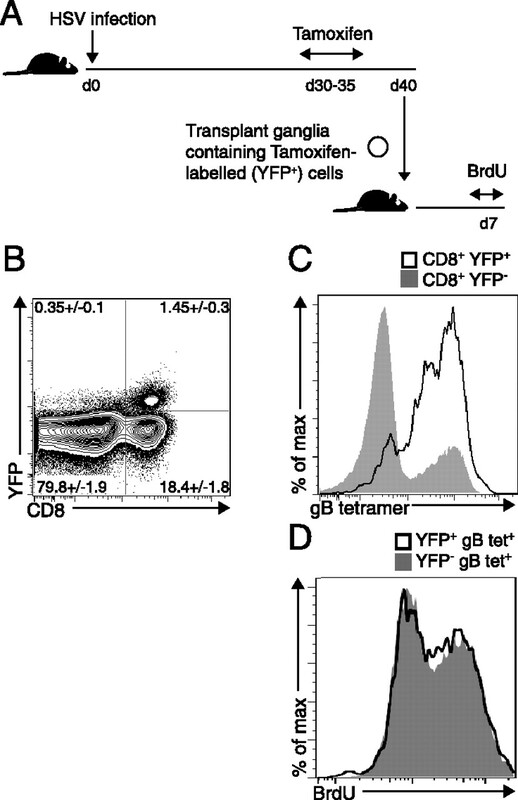 (C) The proportion of gB-tetramer staining cells of YFP+ CD8+ (black line) and YFP− CD8+ (gray-shaded) subsets. (D) BrdU incorporation by YFP+ gB-tetramer+ and YFP− gB-tetramer+ cells. Flow cytometry profiles are representative of five to eight mice per group and three independent experiments. Certain HSV-infected individuals undergo periodic bouts of reactivation, sometimes in a subclinical, continuous cycling pattern (32). The maintenance of functionality, described earlier, implies that T cells that initially seed ganglia early in infection should be capable of responding to repeated reactivation episodes. To show that this is the case, gBT-I cells (CD45.1+) were transferred into C57BL/6 (CD45.2+) recipients prior to infection with HSV. After 20 d, by which time latency had been established, ganglia from these mice were subjected to a round of transplantation-induced reactivation as described earlier. Ganglia were then removed from this primary recipient and subjected to a second round of reactivation at day 15 after primary transplantation, which is well after the day 6 re-establishment of latency in these grafts (17). Note, for secondary reactivation, transplanted ganglia had to be subjected to a short period of in vitro culture (33) to initiate virus replication (Fig. 5A, Supplemental Fig. 3A). Fig. 5B and Supplemental Fig. 3B show that ganglion-resident CD45.1+ gBT-I cells, which had already undergone a reactivation episode, expanded again after secondary virus reactivation and ganglia transplantation. Recipients for both primary and secondary transplantation did not contain any CD45.1+ gBT-I cells (Supplemental Fig. 3C). This argues that the responding transgenic T cells were seeded in the original ganglion donor animals during the initial establishment of latency and were carried over with each successive graft. Thus, not only do T cells retain a proliferative capacity despite chronic Ag stimulation during latency, but also they do so after being subjected to repeated episodes of local virus reactivation. Ganglion-resident T cells can undergo further expansion after multiple rounds of virus reactivation. Latent ganglia containing gBT-I.CD45.1 cells were transplanted beneath the kidney capsule of naive recipient mice. On day 15 posttransplantation, the grafts were recovered and either directly grafted into secondary recipients (without culture) or cultivated in vitro for 2 d before being placed under the kidney capsule of secondary naive recipient mice. (A) Levels of infectious virus isolated from the graft (with or without 2 d of culture) on day 3 after re-transplantation. Bars represent the mean + SEM with three mice per group. (B) Number of gBT-I.CD45.1 cells in the grafts (with or without cultivation) on day 0 or day 9 after re-transplantation. Bars represent the mean + SEM with 6–14 mice per group. The data are pooled from three independent experiments. Our results demonstrate that T cells involved in control of latency do not appear to be compromised. Although the data broadly agree with other reports showing retention of T cell functionality in the latent ganglia (16, 34), they differ from more recent studies suggesting that HSV can induce exhaustion by an unknown mechanism involving latency-associated transcript expression (35, 36). One potential reason for this conflict may have been that only a subset of Ag-specific T cells within the ganglia were actively involved in virus control. Because the majority of T cells within the ganglia do not contact virus-infected neurons (37), one could have argued that only the small proportion involved in this event were rendered exhausted, with the remainder appearing fully functional. However, by using permanent marking of T cell undergoing activation during latency, we were able to show that cells directly involved in virus control also retain full proliferative capacity. As a consequence, the reason why some but not other experimental systems show evidence for latency-linked T cell exhaustion remains unresolved. One should note that Ag specificity was never strictly demonstrated for the latency-associated transcript–dependent mechanism (35, 36). The latter is important, as Ag-dependent exhaustion would seem at odds with effective latency control, where persisting T cell functionality would be critical in suppressing virus reactivation. Moreover, HSV latency is restricted to just a few hundred cells (38, 39), and only a fraction of infected neurons show any level of active transcription with little virus replication (40). Given that T cell exhaustion has been attributed, in part, to active viremia and high virus load (7, 8), the relatively limited nature of the latent HSV infection would seem at odds with this phenomenon. Indeed, the extremely low level of Ag expression associated with HSV latency may be an important contributor to maintenance of T cell functionality. Separately, when virus loads do increase, as happens during disease recrudescence, we have shown that dendritic cell recruitment leads to productive T cell responses (17). As a consequence, local T cells within the ganglia can undergo multiple rounds of expansion as shown in this study. Such T cell expansion seen on reactivation would be impossible if the cells were inactivated by chronic stimulation between reactivation episodes. Thus, our results demonstrate that ganglion-resident T cells remain effective at virus control, either during prolonged periods of latency or when HSV repeatedly cycles from quiescent to active phases of infection. We thank Dr. Thomas Gebhardt (The University of Melbourne) for comments and helpful suggestions. This work was supported by grants from the Australian Research Council and the National Health and Medical Research Council.
. 2000. CD8+ T lymphocyte responses are induced during acute hepatitis C virus infection but are not sustained. Eur. J. Immunol. 30: 2479–2487.
. 1987. Effective clearance of a persistent viral infection requires cooperation between virus-specific Lyt2+ T cells and nonspecific bone marrow-derived cells. J. Virol. 61: 3930–3937.
. 2000. Analysis of successful immune responses in persons infected with hepatitis C virus. J. Exp. Med. 191: 1499–1512.
. 2007. Herpesvirus evasion of T-cell immunity. In Human Herpesviruses: Biology, Therapy and Immunoprophylaxis. Arvin A., G. Campadelli-Fiume, E. Mocarski, P. S. Moore, B. Roizman, R. Whitley, K. Yamanishi, eds. Cambridge University Press, Cambridge, U.K, p. 1117–1136. 1986. Infection in bone marrow transplant recipients. Am. J. Med. 81(1A): 27–38.
. 1997. Infections in solid-organ transplant recipients. Clin. Microbiol. Rev. 10: 86–124.
. 2010. Cutting edge: virus-specific CD8+ T cell clones and the maintenance of replicative function during a persistent viral infection. J. Immunol. 185: 7141–7145.
. 2009. Secondary replicative function of CD8+ T cells that had developed an effector phenotype. Science 323: 505–509.
. 2002. Characterization of two TCR transgenic mouse lines specific for herpes simplex virus. Immunol. Cell Biol. 80: 156–163.
. 2006. CTL response compensation for the loss of an immunodominant class I-restricted HSV-1 determinant. Immunol. Cell Biol. 84: 543–550.
. 2004. Herpes simplex virus-specific CD8+ T cells can clear established lytic infections from skin and nerves and can partially limit the early spread of virus after cutaneous inoculation. J. Immunol. 172: 392–397.
. 2011. Rapid recruitment and activation of CD8+ T cells after herpes simplex virus type 1 skin infection. Immunol. Cell Biol. 89: 143–148.
. 2007. Herpes simplex viruses. In Fields Virology, 5th EdKnipe D. M., P. M. Howley, eds. Lippincott, Williams & Wilkins, Philadelphia, PA, p. 2501–2601.
. 2010. Type I interferons regulate cytolytic activity of memory CD8(+) T cells in the lung airways during respiratory virus challenge. Immunity 33: 96–105.
. 1995. Anergy and exhaustion are independent mechanisms of peripheral T cell tolerance. J. Exp. Med. 181: 993–1003.
. 1997. Frequent genital herpes simplex virus 2 shedding in immunocompetent women. Effect of acyclovir treatment. J. Clin. Invest. 99: 1092–1097.
. 1971. Latent herpes simplex virus in spinal ganglia of mice. Science 173: 843–845.
. 2006. Latent virus influences the generation and maintenance of CD8+ T cell memory. J. Immunol. 177: 8356–8364.
. 2011. The herpes simplex virus 1 latency-associated transcript promotes functional exhaustion of virus-specific CD8+ T cells in latently infected trigeminal ganglia: a novel immune evasion mechanism. J. Virol. 85: 9127–9138.
. 2011. Expression of herpes simplex virus 1-encoded microRNAs in human trigeminal ganglia and their relation to local T-cell infiltrates. J. Virol. 85: 9680–9685. 1997. Comprehensive quantification of herpes simplex virus latency at the single-cell level. J. Virol. 71: 5423–5431.
. 2008. CD8(+) T-cell attenuation of cutaneous herpes simplex virus infection reduces the average viral copy number of the ensuing latent infection. Immunol. Cell Biol. 86: 666–675.